There has been no detonation of ammunition on the territory of the Arsenal of the Defense Ministry of Ukraine No. 6 in Chernihiv region lately, according to the website of the Chernihiv Regional State Administration. 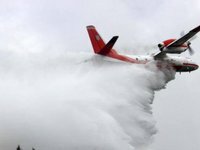 "On Saturday morning, starting from 7:00, the Aviation of the State Emergency Service carried out reconnaissance of the technical territory of the arsenal, two AN-32P fire aircraft made two water discharges within the arsenal and outside the technical territory," the report says.